Is Monterey Park finally getting its own craft beer and cocktail bar? It would certainly be nice if I didn’t have to drive too far to have a decent alcoholic drink that I didn’t make myself or have Will make for me. We went to the soft opening of Spirit House Bar, located on the second level of Lincoln Plaza Hotel and it already had a Golden Road brew on tap and a handful of cocktails to choose from. Not in the mood for something super-IPA, I ordered a Taps Cream Ale, which satisfied my craving of something a little light and as easy to drink as a pilsner. Hey, I had a huge diner — don’t judge me. 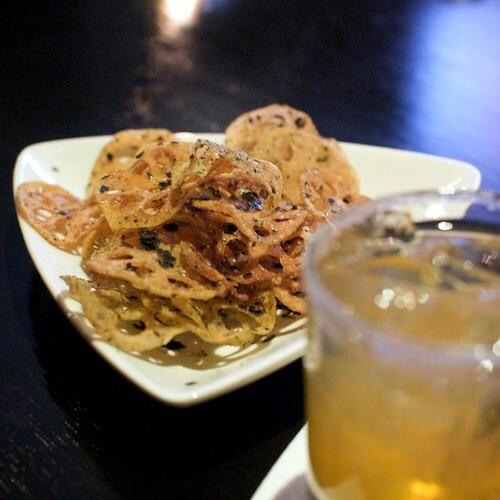 To help with the drink consumption, we were served some hard-to-turn-down, crispy lotus chips dusted with a savory mix of two types of seaweed. Crispy and savory? Best bar snack ever? Perhaps. I also sampled a few bites from their experimental menu:fried chicken wing with a soy sauce and ginger glaze, and a small bite of chicken salad served on top of fried Chinese bread. 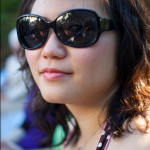 If you’ve ever had that soft, sweet loaf of bread from any Chinese bakery, you’ll know what I’m talking about. Fry a slice of that up and you’ll think it was the most unhealthy but delicious thing ever. Top it with a nicely seasoned chicken salad with tangy julienned cucumber and it’ll be even better. By itself, the fried chicken wing was as good as a deep fried wing could get, but the drizzled sauce on top gave it an edge. While I only tried Spirit House’s soft-opening food, I have high hopes for the food coming out of the kitchen and what else gets added on tap. Veggie World is a restaurant which confuses me in several ways. First, its name, which in English says “Veggie World,” yet in Chinese characters, says “Vegetarian Fragrance Garden” or 素香园. I’m not sure why they needed to include the word for “fragrance” in their Chinese name because it doesn’t really make sense. Also, how did ‘garden’ turn into ‘world?’ Second, it’s in the middle of Monterey Park, has Chinese characters on its sign, and its decor is Chinese, yet our waitress couldn’t speak a word of Mandarin, nor Cantonese, nor English — she was Vietnamese. The Vietnamese part makes sense after noticing the neon sign in the window that says “Pho” and seeing that their menu does indeed have a section full of Vietnamese noodle soups. Naturally, I ordered the vegetarian beef pho. The BF ordered the bun bo hue. We split an appetizer of fried spring rolls. 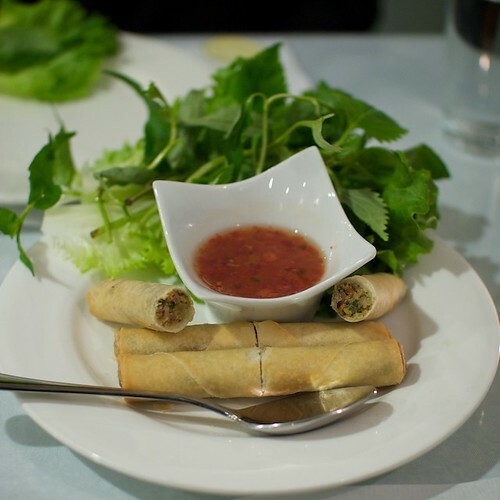 When the spring rolls showed up, I was taken aback. They were cigarette-thin sticks and the wrapper wasn’t what I expected. The wrapper was more Chinese style instead of the Vietnamese styled rice paper wrapper. Luckily, the filling was decent. I just wish there was more of it and that it was in a fried rice paper wrapper. Sitting next to the garnishes that they’re meant to be eaten with, the rolls looked comically small. The sauce it came with, while good and had some chili pepper in it, was a tad too sweet. I was also searching for the usual pickled radish and carrot garnish that accompanies Vietnamese eggrolls, but was sad to see none on the plate. 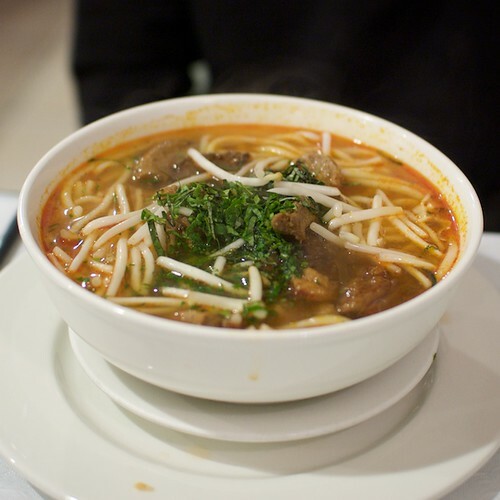 The bun bo hue that the BF received looked alright. The noodles were sufficiently springy and slick, but the key feature of the dish, the broth, was lacking. Now I understand that it’s not going to taste like real bun bo hue that has meat in it, but this one just didn’t have much depth. Unfortunately, my pho didn’t fare much better. If the restaurant had named this dish anything other than pho, I would have been fine with it. Heck, they shouldn’t even mislead people into thinking this was pho with a bright neon ‘pho’ sign in the window! 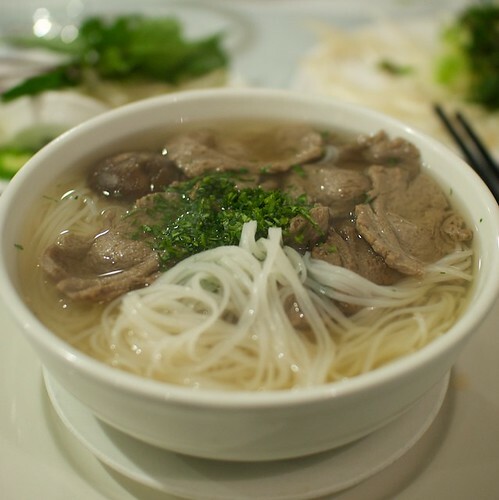 When I think about pho, I think of the fragrant broth full of star anise, charred onion, fennel, other herbs and spices and last but not least, beef. I expected none of the beef flavor in a vegetarian version of the dish, but my bowl also had none of herbs and spices that are crucial in pho. Veggie World’s version just tasted mushroom-like and sweet. Because the broth was so light and sweet, the faux beef pieces ended up being bland and unexciting instead of soaking up some flavor that would have come from the herbs and spices. At least the noodles weren’t clumped together like they had been sitting around cooked for a while. I was excited to try out a new vegetarian Vietnamese restaurant so close to my parents house. Ever since I learned that Thuyen Vien closed down for the time being, I had been thinking there should be more veggie Vietnamese places that serve good renditions of traditionally meat-filled dishes. While eating at Veggie World, I realized through eavesdropping that they probably specialize not in the Vietnamese noodle soup dishes, but more on the fake meat dishes like vegetarian Beijing (Peking) Duck. It’s not fair to judge a restaurant on its initial month of opening, so I’ll probably end up going back another time to try out some other, hopefully more successful dishes. Supposedly, this is the same restaurant that was a bit east in Rosemeade, so maybe once they iron out the details of moving, the food will get better. What is Chiu Chow food? That’s what I wondered when I stepped into Kim Fung Restaurant. The Monterey Park restaurant serves Chinese, Vietnamese and Chiu Chow (aka Teo Chow) dishes. A glance at the menu shows as much. An old co-worker who’s more familiar with this type of food recommended the leek bao, which I started off with. 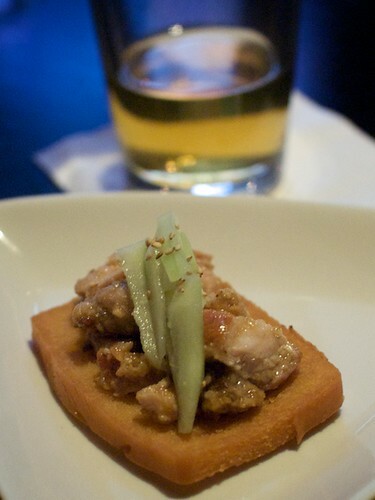 Perhaps the strong taste of leek was not a smart appetizer to order, but I liked it. 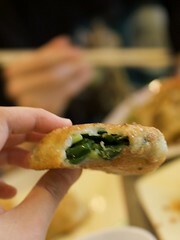 It’s like a large savory mochi stuffed with chopped up leek, and then flattened and fried in oil. The crispy, hot outside gave way to fragrant, tender leeks inside. Dipped in the vinegary fish sauce, the bun was a delightfully strong punch to my senses. 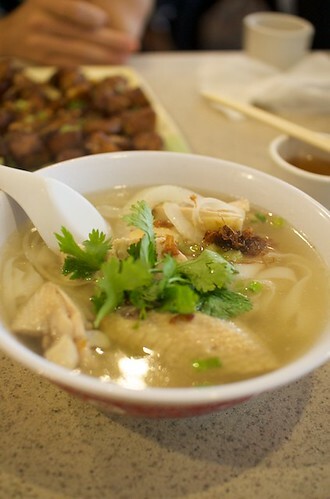 One of the lunch specials of the day was a chicken rice noodle soup, which I ordered with wide noodles. When it came out, I was surprised at how closely it looked like my family’s chicken rice noodle soup, which I always thought of as Vietnamese. Perhaps my family’s version has roots in Chiu Chow cuisine because this was as close as it got to my mom’s soup. The broth was a clear, savory, and full of chicken essence. The wide rice noodles were slippery and had the satisfying mouthfeel I liked about these types of noodles. There were also large chunks of chicken in the soup, but they were pretty dry and unflavorful. The BF ordered the fried rice-cakes, which are slightly different than the Shanghainese nien gao we usually order. 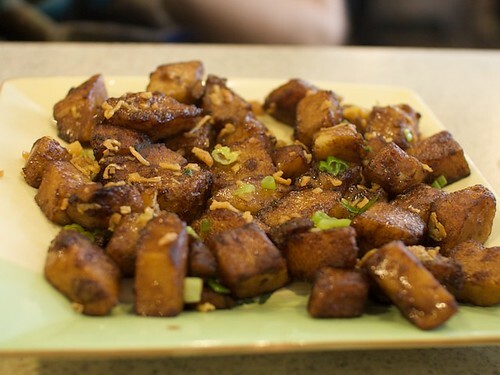 Unlike the Shanghainese rice cakes, these were cut into rectangular shapes and fried on all sides with some soy sauce and oil. He also requested was to get it without the usual scrambled egg on top, but I think they’d be perfect with the egg. Instead, the kitchen sprinkled some chopped up pickled vegetables and green onion on top. The rice cakes were soft but chewy and had a good char from the high-fire wok. 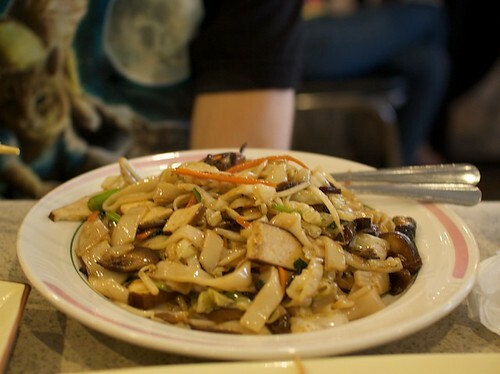 We also ordered a vegetarian chow fun with thick rice noodles, which were pretty standard. The flavor of the vegetables were hightened by the wok qi and the Chinese celery gave it an interesting, strong distinct taste. The noodles weren’t stand-out, but decent and full of MSG. Kim Fung Restaurant is a quick and easy place to go for a good, cheap meal. I’m still not sure what Chiu Chow food is or how to even describe it other than saying it’s a little like Vietnamese food and a little like Chinese food. The service at Kim Fung is stereotypical of restaurants which cater only to Chinese people, so don’t expect 4-star service.